Unbound by a traditional up or down, ESA astronaut Alexander Gerst is getting a handle on how microgravity affects our ability to grab and manipulate objects in space. It’s all part of the French Gravitational References for Sensimotor Performance (GRASP) designed to give researchers a better understanding of how our brains draw information from different sources – like sight, sound, and most importantly in this case, gravity – to aid hand-eye coordination. The principal investigator (PI) for the GRASP experiment is Dr Joe McIntyre at the French National Centre for Scientific research and it forms part of his wider work, looking at Sensori-motor Adaptations and Vestibular Pathologies. 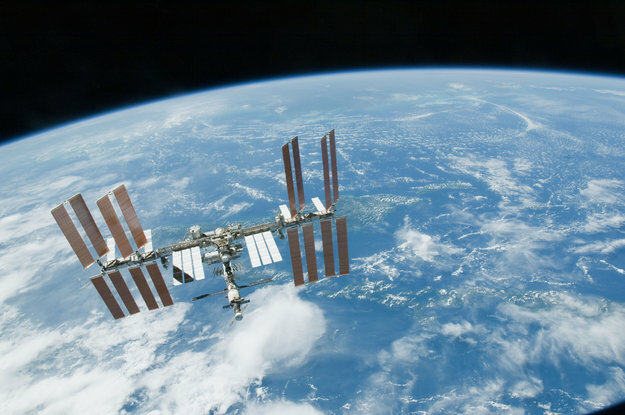 ESA astronaut Thomas Pesquet was the first to use the specialised Perspectives virtual reality (VR) gear on board the International Space Station during his mission in 2016. Coupled with a laptop and driven by an audio/graphics system, the VR headset simulates a series of tasks for the wearer, while a 3D motion tracker updates the display in real time in response to their hand, body and arm movements. To get an idea of the differences in how our brains work both with and without gravity’s pull, the GRASP experiment is also conducted back on Earth. 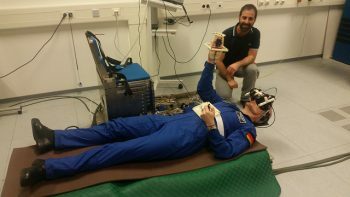 ESA astronaut Alexander Gerst carries out the GRASP experiment on Earth ahead of his Horizons mission, supported by PI Joe McIntyre. Credit: ESA – J. Harrod. Armed with an enhanced understanding of the physiology behind hand-eye coordination, researchers will be better able to treat disorders relating to vertigo and dizziness, balance, spatial orientation and other aspects of the vestibular system. It will also be helpful in guiding astronauts during spacewalks and developing the most effective ways of controlling robots remotely. This is applicable not only to astronauts exploring new solar landscapes, but also surgeons and other professionals who may need to operate equipment from afar. While our astronauts are pretty quick, the experiment isn’t quite as speedy as what you see here. In fact, just to create this short clip, our team condensed 20 minutes of real-time footage and numerous sessions will be carried out during the Horizons mission. Can you spot Alexander’s cheeky addition to the experiment? The German flag deployed on the ‘floor’ of the Columbus module, is there to block reflections that disturbed the infrared sensors – a simple, yet effective fix that in this case saved the day. Hm, I would love to see a human version of the ‘falling cat problem’ in space. So can Alexander do a 180 degree flip while freefloating in space?